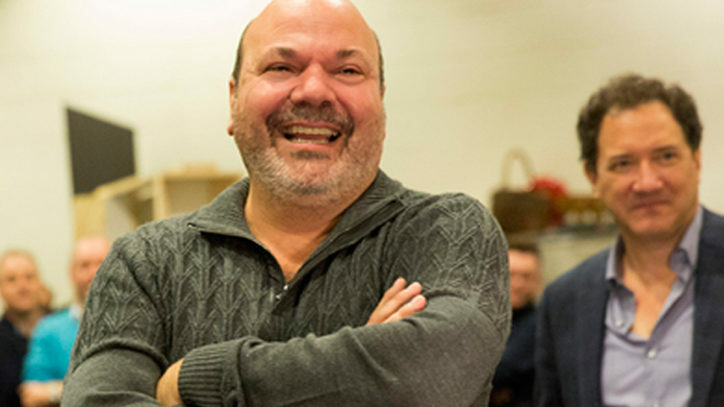 In March, Tony-winning director-choreographer Casey Nicholaw will hold a new record in the current Broadway landscape. His name will be on the boards of not one but three theatres. A Broadway baby at his core, Nicholaw is behind a handful of theatrical productions currently playing in New York, across the country, and on London’s West End. The chorus boy turned director-choreographer is responsible for mounting Disney’s latest theatrical venture, the 2014 hit Aladdin, along with co-helming the 2011 Tony-winning musical The Book of Mormon with South Park creator Trey Parker. In addition, he has a few new projects in the works. Similar to the way Nicholaw brought Mormon to the Main Stem — a journey that involved opening cold in New York — he is currently prepping his next project the same way: a brand-new original musical for Broadway called Something Rotten! The show, set at the end of the 16th century, follows the story of The Bottom Brothers — Nick (Brian d’Arcy James) and Nigel (John Cariani) — who are suffering in the shadow of the success of The Bard (Christian Borle) and who are on a mission to create the world’s first musical. “If I had to compare Something Rotten! to any of my other shows, it would be a combination of Spamalot meets The Drowsy Chaperone,” Nicholaw said during a rehearsal break for Tuck Everlasting (yet another musical he directed and choreographed this year, now playing at the regional Alliance Theatre in Atlanta). With Something Rotten!, Nicholaw has joined forces with a creative team of Broadway newbies — including brothers Karey and Wayne Kirkpatrick, who wrote the music and lyrics, as well as John O’Farrell, who wrote the book with Karey. Karey Kirkpatrick is an L.A.-based screenwriter and director (Chicken Run, Charlotte’s Web, James and the Giant Peach) and Wayne, a Grammy-winning songwriter, has worked with various country music artists including Garth Brooks, Faith Hill, and Trisha Yearwood. O’Farrell, on the other hand, is a well-known author and writer from the U.K. But it was veteran producer Kevin McCollum (Rent, Avenue Q, In the Heights) who encouraged his longtime friend Karey to fulfill his dream of crafting an original musical. And why wouldn’t McCollum phone Casey Nicholaw? The 52-year-old cut his teeth on the Broadway stage in the choruses of Crazy for You and Victor/Victoria, as well as Thoroughly Modern Millie, among many others. He made his debut as choreographer on Broadway with the late Mike Nichols’s Tony-winning production of Spamalot in 2005 and took on his first directorial project with The Drowsy Chaperone, which marked his first Broadway collaboration with McCollum. As for his most formative moment on the stage? That dates back to his Broadway debut in 1992. Crazy for You was my first show — I was in the ensemble. Susan Stroman’s dances in that show were spectacular. And watching her and the late director Mike Ockrent work together was such magic,” Nicholaw explains. It’s no secret that Nicholaw’s “Mr. Nice Guy” persona is infectious — and that’s something that’s evident not just when he’s talking to the press, but also when he’s collaborating with his fellow artists. Nicholaw’s first Broadway project came around the time he met McCollum. With Something Rotten! opening this season there’s no denying that Nicholaw is in fact a true king of Broadway – represented with a triple crown of shows. And perhaps this project is a summation and celebration of all of Casey’s work both on the stage and behind the scenes.